Posted On Tue, 04 Apr 2006 00:48:00 +0000. 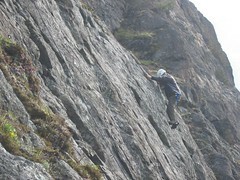 Filed in rockclimbing. By Vaibhav Bhandari. Patrick trying rope three Originally uploaded by vbha. Yesterday i did my first rock climbing ever. Through Mountaineers Rock 2 field trip we did some runs on Mt. Erie. It was awesome to do three climbs using techniques like edgeing, manteling, crack climbing etal and the weather was a lot better than I expected. Just couldn’t get enough of this thrill. Watch out for some rapelling pics and more of climbing stuff as i learn the ropes of this ride :).